Oh soooooo simple! I mean both the card AND signing up for the Create with Connie and Mary Valentine Mini Collection!!! No…seriously…it really is THAT simple and you don’t want to miss it! And speaking of simple, here a fun (and quick) little notecard for someone special in your life. Stamp the Ampersand in Calypso Coral, Your Sweet in Memento Black. Add some Gold Sequins to finish off. Oh my…it’s day 3 of the Create with Connie and Mary Valentine Special MINI Collection 2015! The collection runs Dec 26th through the 29th so that our demo subscribers have plenty of time to set up their classes, but you don’t need to be a demo to join us! Sign up TODAY at Create with Connie and Mary so you don’t miss out! This MINI collection will be slightly different…only FOUR projects…and only $5.95 US!!! 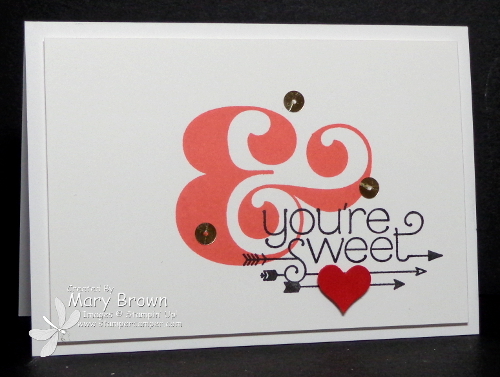 A mini session featuring the You Plus Me and Hey, Valentine suite of stamps and accessories! FOUR step-by-step pictorial project tutorials…two card set tutorials and two 3D projects! NEW! Kits of supplies for each project will be available for subscribers to purchase! Featuring the Stacked with Love Designer Series Paper Stack on all our projects! ONE tutorial revealed EACH day on Dec 26, 27, 28 and 29. Exclusive to subscribers, these projects will not be shown ANYWHERE else! 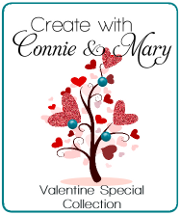 Join today over on Create with Connie and Mary! This entry was posted in Clean and Simple (CAS), Create with Connie and Mary and tagged You Plus Me. Bookmark the permalink.